Blue Planet II : The Prequel. This world-exclusive introduction to the show is narrated by series presenter Sir David Attenborough and set to an exclusive track developed by Hans Zimmer and Radiohead. The prequel features an array of some of the most awe-inspiring shots and highlights from the new series, as well as several exclusive scenes that will not feature in any of the seven episodes which are set for UK broadcast on BBC. The prequel is published by the BBC Earth Channel and features an array of some of the most awe-inspiring shots and highlights from the new series, as well as several exclusive scenes that will not feature in any of the seven episodes which are set for UK broadcast on BBC One later this year. 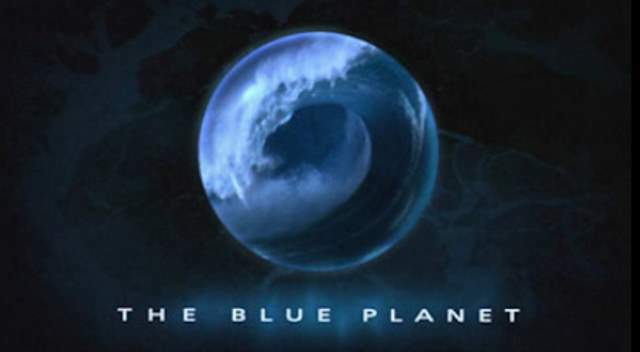 The Blue Planet series title card from UK broadcast. The original series took almost five years to make, involving nearly 200 filming locations and being aired in late 2001. Each of the eight 50-minute episodes examines a different aspect of marine life. The underwater photography included creatures and behavior that had previously never been filmed. The series won a number of Emmy and BAFTA TV awards for its music and cinematography. The executive producer was Alastair Fothergill and the music was composed by George Fenton. David Attenborough narrated this series before presenting the next in his ‘Life’ series of programmes, The Life of Mammals (2002), and the same production team created Planet Earth (2006). Attenborough also narrated Planet Earth II later. Since the 1980s, Hans Zimmer has composed music for over 150 films. His works include The Lion King, for which he won Academy Award for Best Original Score in 1994, the Pirates of the Caribbean series, The Thin Red Line, Gladiator, The Last Samurai, The Dark Knight Trilogy, Inception, Interstellar, and Planet Earth II.